Domino's Pizza Japan is planning a lunar franchise. In 2001, Pizza Hut was the first pizza chain to make a delivery into space, bringing a pizza to the International Space Station. Since then, Domino’s has been playing catch-up. In between completely revamping their recipe and working on a breakfast pizza, they’ve been making plans. Domino’s Pizza Japan is planning on building a franchise location on the moon. 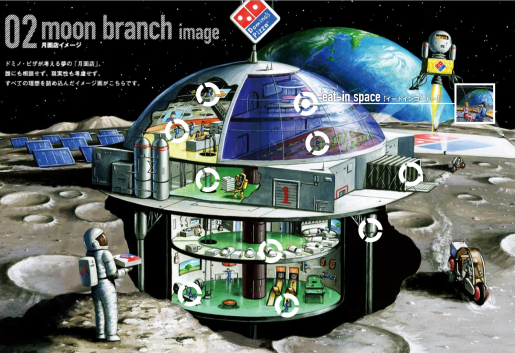 They’ve even created a website for Domino’s Moon Branch Project (though it is in Japanese). In order to cut costs, Domino’s is planning on building the franchise out of mooncrete, using local moon-based building materials. Even by cutting costs that way, the franchise will cost an estimated Y1.67 trillion yen, or $21.74 billion US dollars. It’s going to take 15 rockets to transport the 70 tons of building materials and equipment to the moon to get this thing done. I can only imagine just how much labor costs are going to run! Domino’s is also planning delivery service on the moon, so you won’t even have to leave your mooncrete pod and put on your space suit to enjoy a fresh slice of Domino’s pizza. Hopefully it will be a very highly paid deliveryman making such a dangerous vacuum delivery on the back of a lunar rover or whatever.